Enjoying being back in the sand at the cabana this summer. Hello all – We had sworn we’d done a more recent update, but our last one was about our Make-A-Wish trip back in February. We had a very busy spring between school, recitals, lacrosse, graduations, moving up ceremonies and the sort. The good news is that while Sally struggled to adjust at school during the fall, she did great the last few months and her teacher and the staff were so impressed with her turnaround. Sally is attending school this summer so she can continue with her various therapies and stay in a rhythm, as she sometimes gets into a funk if she’s not out interacting with kids. Sally was on Fox 5 News where she was reunited with Lauren and Adrienne, her original in-patient daytime nurses at MSK. Rooting on William at his lacrosse game. After seeing Thomas & William benefit greatly from a new therapy dog program at their school, we did some research and spoke with Sally’s doctors who felt a dog would be beneficial for both her and our family. 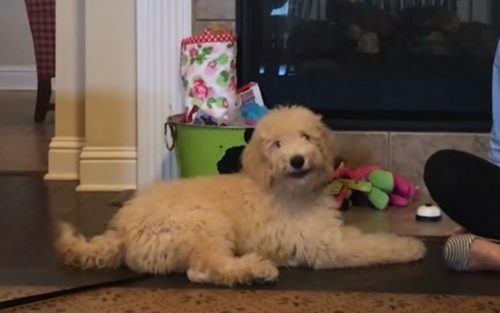 Sally’s Aunt Sarah held a fundraiser for us to get a dog from a reputable trainer for Goldendoodles (a breed that most matched our plethora of family needs/challenges) and 16 weeks of training as it would have been too hard on us to do ourselves. Charlie (named after A Charlie Brown’s Christmas) will be coming home to us in September. We hope he’ll have natural instincts that will support Sally, like advance seizure warning, but won’t know for awhile and isn’t guaranteed. For now he will be a trained therapy dog, we may pursue training him to be a full service dog for Sally depending on how he integrates with her. As we’ve said before, Sally has good days and bad days, so we have to pay close attention to overall trends. Since Christmas, we’ve felt that despite doing well at school, the overall trend of her health has been declining. For example she has a much harder time with stairs now, is unsteady walking and we even had to stop taking her to dance class on Saturdays because she couldn’t stay awake long enough to attend, and when she could Sally couldn’t keep up with her younger classmates. It’s mostly evident on Facebook Memories, when you can clearly see she doesn’t look as good or can’t function as well as she did a year ago. You can see a clear difference in Sally looking at photos from a year ago compared to now. First of all, she’s had an increase in seizures and their intensity. She’ll be sitting at the table eating and then all of a sudden her head will drop and sometimes even smack the table hard or land in her plate of food. You can click here to see a more subtle example. They’re hard to catch on video as it usually happens without warning, and she’ll be spaced out for a few minutes after. It can also happen when she’s walking, we’ve landed in the ER twice this spring after she’s fallen and cut open her chin. Second ER visit getting her chin glued shut. 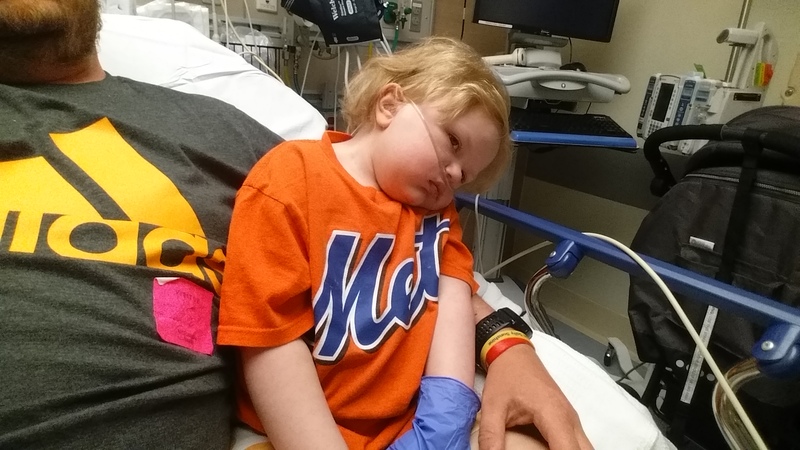 After speaking with Dr. Devinsky’s team, we decided it was time to try switching her from the Charlotte’s Web CBD oil to the NY legal medical marijuana. The difference is that medical marijuana contains small amounts of THC which could work better with some seizure disorders and will hopefully help with her GI issues (below). After several weeks of paperwork and approvals, we finally received our NY Medical Marijuana cards. Matt visits a dispensary in Manhattan that is almost spa-like (except for the guard outside), where you meet with a pharmacist. Sally is on an oil that we squirt under her tongue, and are in the process of phasing it in and the CBD oil out. We meet with Dr. Devinsky’s team this week for a check-in. 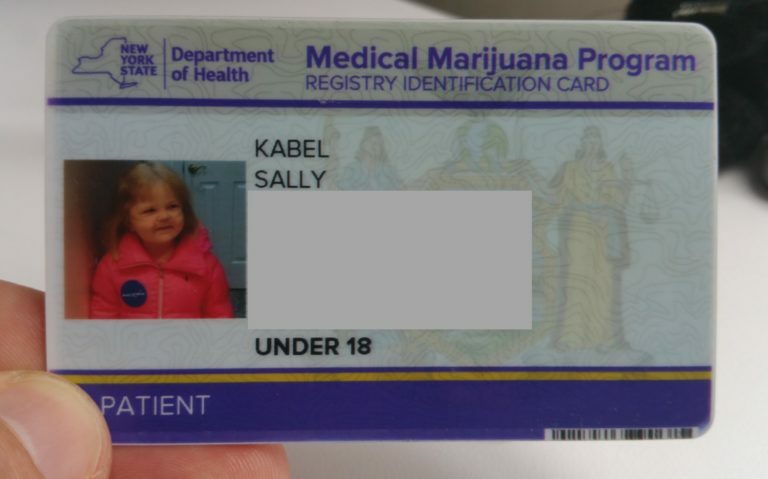 Sally’s NY Medical Marijuana ID card. Secondly, Sally’s GI issues continue to be a challenge. She almost constantly has blood/mucus in her stools, and she varies between diarrhea and constipation. Over the last three months, Sally has put on almost 15lb despite no change in her diet or activity levels, and nobody knows why. We fortunately had scheduled an appointment months earlier with a renowned GI specialist at NYU, Dr. Levy, and saw him recently. He sat with us for 90 minutes and talked through all of Sally’s issues. He put her on Miralax for a week to clean her out, and took some stool samples, we look forward to working with him and hearing his insights on Sally. 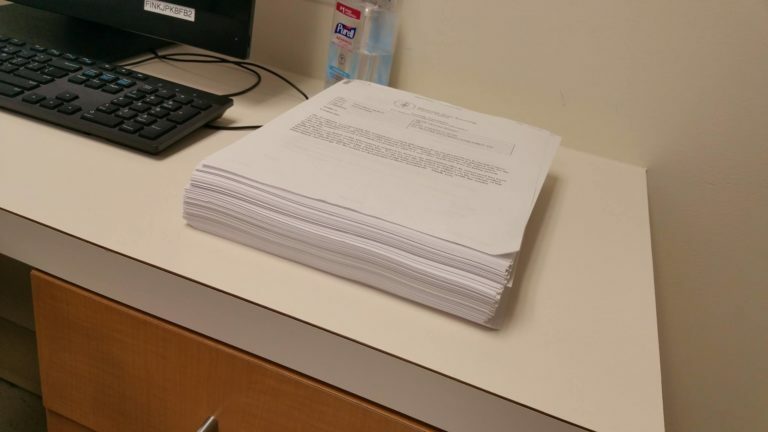 This stack of 460 pages represents Sally’s medical history at Memorial Sloan Kettering. 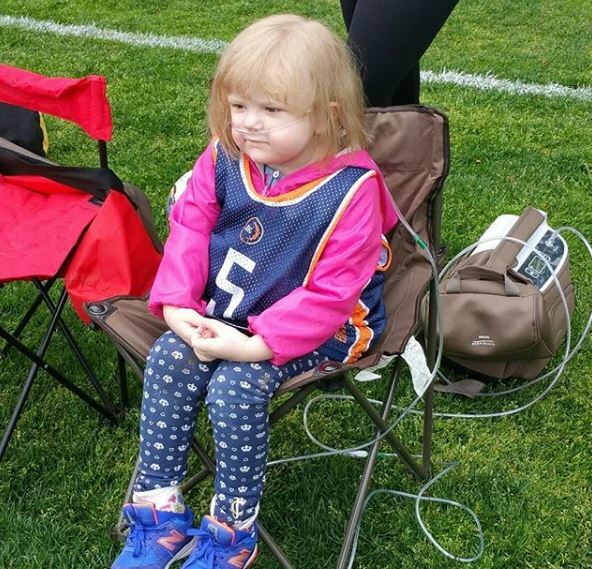 Finally, Sally’s breathing issues continue to be a challenge as she remains on oxygen support. Our previous two pulmonologists at Cornell left, so we decided it was time to switch her to Dr. Shah at NYU who has seen her in the hospital during her many stays. He increased the pressure on her CPAP machine so for a few nights Sally didn’t require any additional oxygen for the first time in over a year. 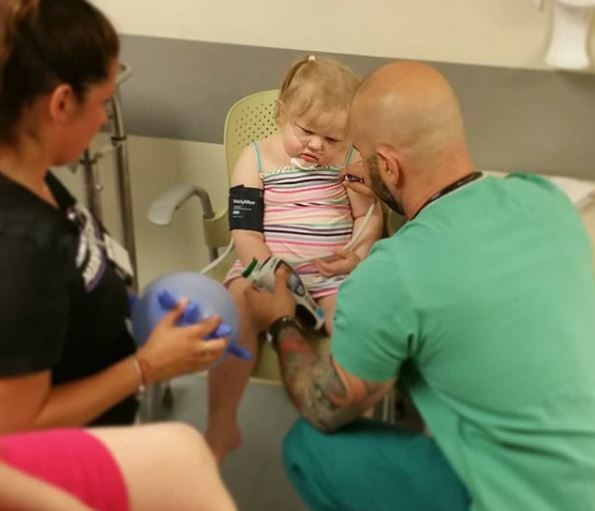 Dr. Giusti, head of Pediatric Cystic Fibrosis (CF) at the hospital was also looped in. He had her take a CF sweat test, which we had attempted at Cornell but results were inconclusive. To the surprise of all, Sally’s results on this test showed a potential positive for Cystic Fibrosis. 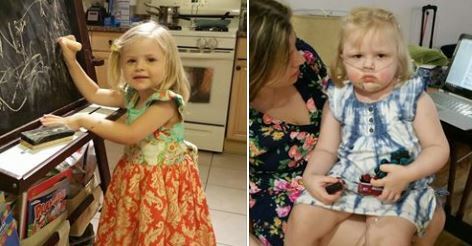 The surprise is due to Sally’s birth screening and genetics testing not showing the gene for CF, which is required in order to have it. We were planning to retake the sweat test this past week, but Sally fell ill and we took her to the ER on Tuesday. She required more oxygen support, so they decided to keep her overnight for observation. One night turned into four as her needs increased almost to the point of landing her in the PICU. Feeling lousy in the ER. She was given steroids and an antibiotic, finally turning the corner on Friday and was released on Saturday. While inpatient it was determined that Sally suffers from a pancreatic deficiency. 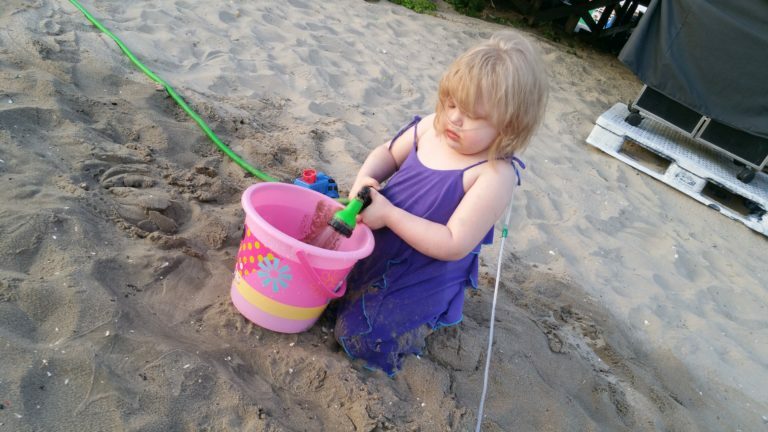 This is something we’ve suspected, and have had her on a pancreatic enzyme as she has difficulty processing fat and protein, but it checks yet another box for CF. She has also become anemic. NYU just opened their new Children’s Hospital a few weeks ago. The rooms are all private, digitally controlled, have plenty of space/privacy and access to an outdoor area. Sally’s room overlooked the East River where we watched helicopters and seaplanes take off/land and lots of boats . The next step for Sally is to retake the sweat test in a few weeks as steroids can mess with the results. If that test shows any form of a positive reading, it’ll be sent to the CF Foundation who has a specialized test that can examine every one of Sally’s genes to see if she has any components of CF in her genetics. Although she checks most of the boxes for CF, and we’re treating her as such, we aren’t convinced that Sally actually has the disorder. It would be very rare for her to have gotten this far with all the testing she’s had done for doctors to have not caught it earlier. Like with her form of epilepsy, she checks most of the boxes for Lennox Gastaut Sydrome. We treat her for it, but Dr. Devinsky hasn’t formally diagnosed her with it as we know Sally’s was caused by chemo. We think there’s something similar occurring here with the CF symptoms. 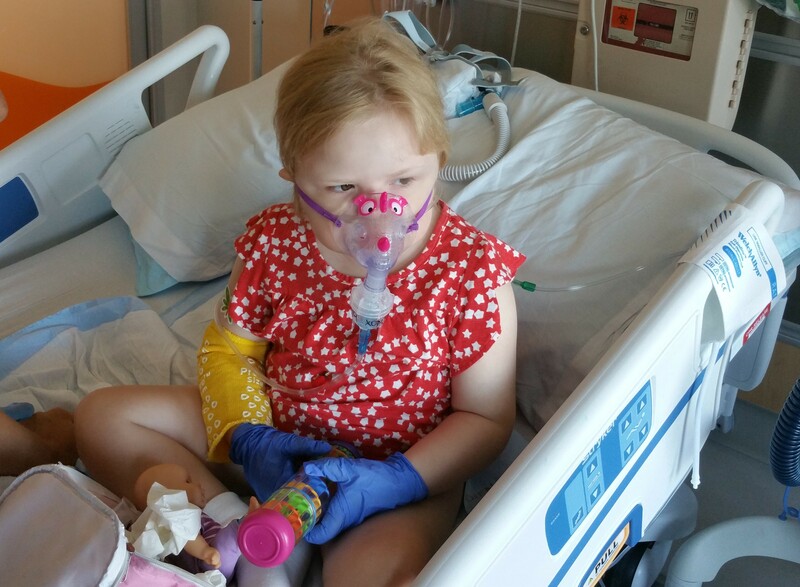 Sally continues to get nebulized every 4-6 hours as she has for months. Unfortunately this is the tip of the iceberg, we could go on and on about additional issues she’s enduring. We have more tests scheduled, but after what felt like a year of status quo in Sally’s medical care where her overall health declined, we’re very relieved to see more investigation being done by a fresh set of eyes. 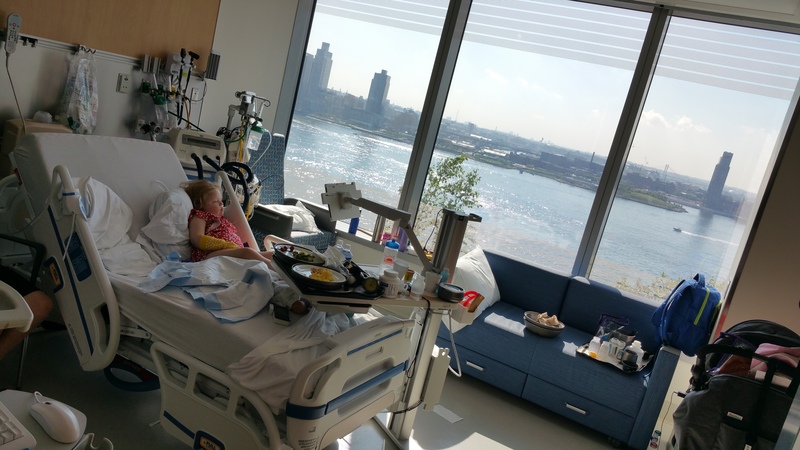 As Nicole remarked to Dr. Levy at the end of our appointment with him – it feels like we’re just fighting to keep Sally alive every day, hoping it buys her time for somebody to figure out how to help her before it’s too late. 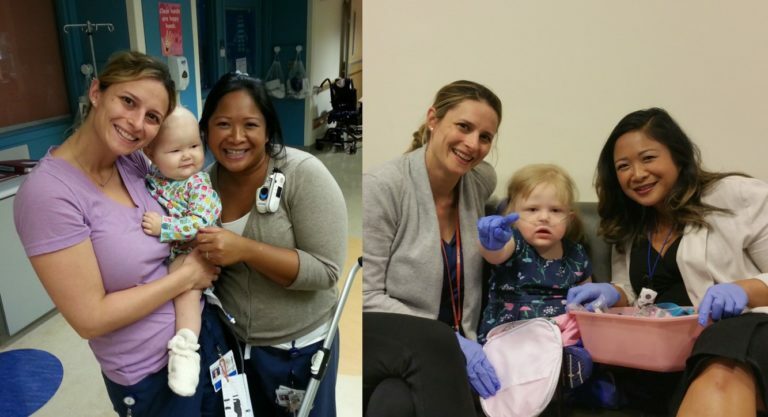 By switching most of Sally’s doctors to NYU Langone, where her pediatrician (Dr. Oppenheim) and Dr. Devinsky both are, we’re finally seeing a true collaboration of medical minds that we haven’t seen since Sloan Kettering, and is refreshing to actually watch them all talking to each other about Sally. The next few weeks of testing and conversations will be integral. We know that Sally will always keep us guessing, but our hope is that we can reverse this downward trend and get back some of that sassy, sunny, outgoing, sweet Sally who we’ve all come to love. I live in GGE Roth your dad Tom. I have grandchildren Sally’s age and I cannot even imagine watching any of them go through any part of what Sally has been through. My thoughts and prayers are with your family. I wish there was something more I could do other than this. Hang there Kabel Family. You are in my prayers. Portland Bills Backers participated in the fund raiser for Charlie. Hope this lovable guy can bring a new and joyful dimension to your lives. God bless all of you. Prayers and good thoughts are coming your way. I know it isn’t easy, but blessings will surely be there some day. Love seeing your post. Always thinking of Sally and the Kabel family. Glad there are fresh eyes looking at Sally. I cannot imagine what you are all going through. God watch over all of you and give the physicians the knowledge they need to help her over this hurdle. Sweet Sally will always be in everyone’s thoughts and prayers as the whole family will also be. GOD BLESS the Kabels. Best of wishes to Sweet Sally to pull through this downturn. My cousin-in-law is a Pediatric Cardiologist at NYU Langone. Dr. Sujata Chakravarti. Not sure if she is on the team of doctors, but I know that she would do her absolute best to help her. Sally derives all of her strength from your beautiful family. Stay strong. Sally will continue to be in my prayers as will your family. I hope that now with all her doctors collaborating as a team, there will be a positive progress for a healthier Sally. You always have our love and support! God Bless her and all of you always…. Praying for a miracle for you ALL! Much love, peace and healing! Overwhelming respect and admiration for your tenacity! Second and third and even fourth opinions are key, I wouldn’t be alive without one;) Love you all! So glad for the update and know that your sweet little girl is in my prayers. Hugs to you all. Dear Kabel, I am glad to hear the update only wish it was more positive. I love the idea of Charlie and hope he brings lots of smiles to sweet Sally’s face. No child should have to go through even a little bit of what your daughter has endured. I admire you all and you will always be in my prayers. Keep us posted, please. Thank you for this update. God be with you on this journey. You are an amazing family. You are in my prayers. Love to all. I encourage you to reach out to a woman named Breck Gamel if you are interested. 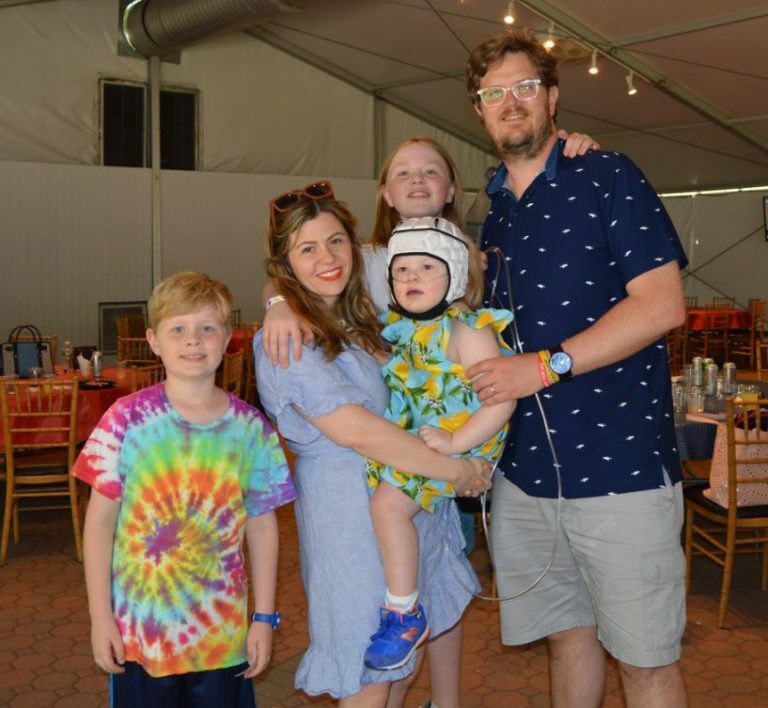 She has a 7 year old son, Bennett, with CF and she has also made many very insightful posts about the mental toll that dealing with a life threatening illness takes on a child’s siblings. Her son Oliver’s anxiety around Bennett’s illness reminds me a lot of of how you described your sons’ anxiety around Sally in a post a while back. In general, Breck is also a fierce advocate for her son and has gone through insurance struggles similar to yours. What a sweet child..so sorry what she is going thru….she and your family are always in my thoughts and prayers…Sweet Sally Sunshine…..the boys are getting so big…I hope you get some of the answers you have been praying for…..I will be praying that your next post has positive news,for all your sakes……much needs to be done to bring treatments for childhood cancer up to date…the dog is such a wonderful dog for the whole family…..I’m sure she will help alot!